Is a coverstitch machine really necessary? What type of coverstitch machine should I get? And can a coverstitch machine be used for other things than hemming knits? Those and a lot more topics are covered in my livestream about coverstitching. Plus you get to hear about my visit to a garment factory and learning more about how coverstitch machines are used in an industrial setting. As always, the chat was very lively with lots of great questions and tips, including such gems as how to improve the control on our foot pedals. I also want to give a special thanks to everyone who participated and to say how much the means to me, I was feeling really tired yesterday after Saturday’s half-marathon and was a bit worried I would be able to do the livestream and speak coherently for an hour. Doing liveshows can be quite intense, especially since mine also requires a lot of research beforehand and are very information dense, so my brain is on hyperdrive! But interacting with you guys gave me so much energy, so thank you! Contains lots of coverstitch info! Also, check out the wonderful Coverstitch/Coverlock Facebook group that I mention in the video! If your coverstitch machine use ELX-needles, get this brand! 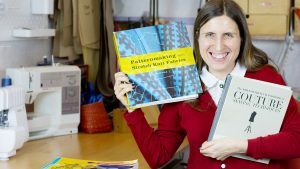 Video: Best sewing books for improving your skills! And thank you for being such an incredible resource of information in the chat! It makes my job easier too 🙂 As for the notifications, I heard that YouTube will not always notify viewers about the streams they follow since they want to keep that delicate line between being helpful and spamming users with notifications. Good to hear that they at least sent out one just before and you were still able to watch it!